Awards will be presented for overall male and female winners! 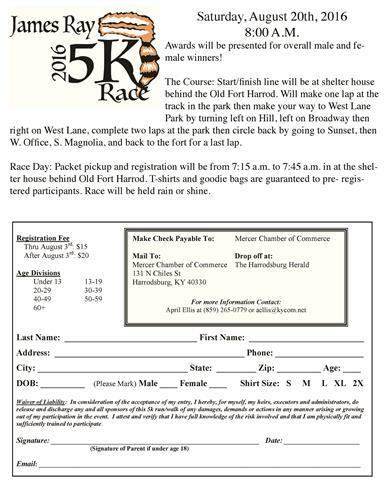 The Course: Start/finish line will be at shelter house behind the Old Fort Harrod. Will make one lap at the track in the park then make your way to West Lane Park by turning left on Hill, left on Broadway then right on West Lane, complete two laps at the park then circle back by going to Sunset, then W. Office, S. Magnolia, and back to the fort for a last lap. Race Day: Packet pickup and registration will be from 7:15 a.m. to 7:45 a.m. in at the shelter house behind Old Fort Harrod. T-shirts and goodie bags are guaranteed to pre- registered participants. Race will be held rain or shine.